Parker Bows, a manufacturer of high quality Compound bows, Crossbows and RED HOT brand Crossbow Accessories is proud to introduce the new RED HOT brand 1X Illuminated Multi-Reticle Crossbow Scope. This multi-purpose crossbow scope is perfect for crossbow hunters looking to increase their accuracy in the field. The RED HOT 1X Illuminated Multi-Reticle Scope is extremely versatile, perfect for hunting turkey, deer and other large game species. Constructed with a one piece monotube chassis, the new 1X scope features a crystal clear reticle with Laser Etched crosshairs that Illuminate to red or green. The 1X Scope provides the hunter range and visibility in low light conditions with 5 brightness settings for each color and 6 aim points out to 50 yds. Made with high grade aluminum, it is also Lightweight and Ultra Compact which is important in reducing the overall weight. The 1X Illuminated Multi-Reticle Scope is Waterproof, Fog Proof and Shockproof and comes with a Fast Focus Ocular Bell, Fixed 1x Power Magnification, and a Lifetime Warranty. The RED HOT 1X Illuminated Multi-Reticle Hunting Scope has a retail of $149.95. 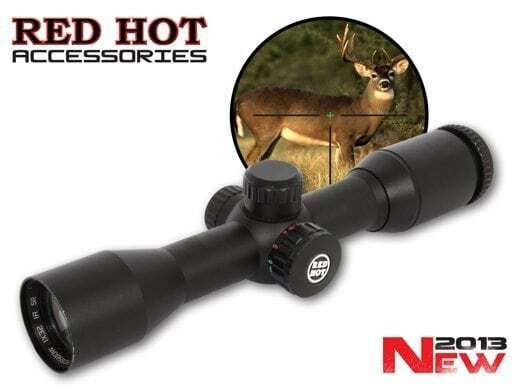 If you would like more information on the RED HOT 1X Illuminated Multi-Reticle Scope, visit the Parker website at www.parkerbows.com or call (540)-337-5426.